So, this just recently happened! This could have happened anywhere at a time I wouldn’t have had the opportunity to notice it. I could have missed it. But, I didn’t. It happened right in front of me in my neighborhood as I looked down to check my speed. So, I pulled over for a pic. There was either a country song in there or a blog. I chose blog. I often see life in metaphors, signs and symbols so, for me, this was huge milestone moment that definitely captured my attention. It actually felt more momentous to me than when I turned 50. Here is how I understood that message. 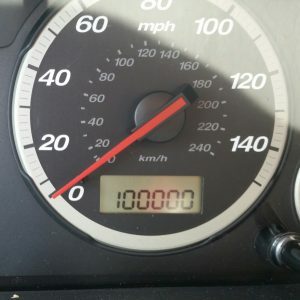 Am I focused on the miles behind me? Am I fixated miles ahead? Or, am I mindful of this moment? My wisdom teachers and healers remind me the past is over and the future has not happened. What we have is the present. We have no power to go back and change the past. To live in the past means we can’t get ahead in our healing. The future hasn’t yet happened. To live only for the road not yet traveled can create distress. Lingering in the past, I can become stuck in fear and anger bringing my spirits down. Looking too far to the future, trying to control for things yet unknown, can lead me to feel anxious and worried. When I am fully in the present, I feel at peace. It is here where I am inspired by what is happening now, to express my purpose and potential that was always there regardless of what might have been, or what might yet to be. So, I practice mindfulness. And, I truly need the practice. There are many ways to practice mindfulness. But, a simple first step is to awaken to the present by stimulating our senses. 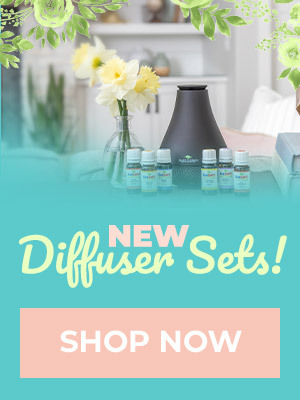 This is where aromatherapy can be truly supportive in our efforts to return when we feel ourselves drifting overlong in our past, or our future. Just the other night, I ate a Godiva truffle while watching TV and reading. And, after I finished it, I realized I had actually not been truly aware of it. A Godiva truffle for gosh sakes! What a waste of a gorgeous sensory experience. But, I had another tucked away. And, the next night, I did nothing but eat the truffle. I closed my eyes, I inhaled, took a bite, felt the texture it on my tongue and really tasted it. Oh my goodness, what a totally different treat. Are we doing the same with our use of aromatherapy? Are we dashing around taking quick hits of this or that essential oil to solve or soothe and issue? Or, are we really inhaling and savoring the scent like the fine distilled essence that it is? Here are two blends that are helpful for me. 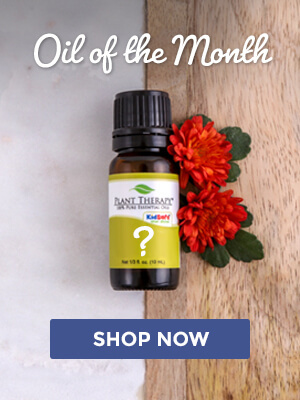 I find essential oils that are stimulating to awaken our awareness, and those that are grounding to anchor us to the sense of being present in the moment. I would encourage you to get out your favorite oils and take a sensory tour through smell to find which ones awaken and ground you. The ratios are scaled for an inhaler stick because I like to keep them with me when I feel I have drifted too far away for too long. 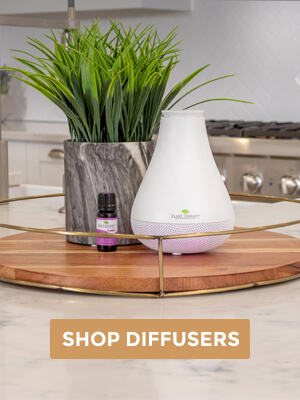 You can also reduce the ratio to suit your diffuser, or make a blend and add a drop to aromatherapy jewelry, or you might even prefer to wear it as a personal scent with the oils you choose. As we head into the season of summer road trips, what is your perspective? A glance behind can be healthy to see how far we’ve come and to learn from where we have been. And, having an eye toward dreams and plans for the future is both healthy and fulfilling. It is when we become stuck in those forward or reverse gears that we can stall out traveling this highway of life missing the scenery, missing the signs and missing the living happening now. So, if like me, you need to practice being present, pack your favorite inhaler for reminders to be mindful on the go. It is an opportunity we give ourselves to consciously live in our most optimal place of wellbeing. “Mindfulness.” Psychology Today. Psychology Today, n.d. Web. 18 May 2016. Katz, Linda. “What Your 5 Senses Can Teach You About Mindfulness.”Mindbodygreen. N.p., 25 Nov. 2014. Web. 27 May 2016. Thank you, Ellen! I (sheepishly) admit that I just now stopped to read this encouraging blog post, and having had a rough week, and knew I would benefit from it! Oh, Gina, I am so glad the message connected with you just when you needed. The blogs are here for folks to read (or reread) in their own time. And, I sincerely believe that the right time is when it is the right time for you –which is exactly how you approached it. Thank you for letting me know it helped. I am so glad! (And, I am rooting for that rose absolute : D )! Just finally read this. You do such a nice job with things! I try to start my day with at least 10-15 minutes of mindfulness meditation every day. You are so right that with mindfulness is how we need to go about our day! I like the idea of an inhaler to help put you there when you have lost it. I have no basil and I wondered if you could suggest to substitute for it? Thank you for always sharing such valuable info with us. Jan, thanks so much. Basil linalool is well thought of for quieting over thinking when it is taking over. Another option might be frankincense carteri. It also can help quiet the mind, especially in preparation for meditation or other types of quiet reflection. Perhaps that might be a good option for your morning meditation. What a great way to start the day!